In this series, food writer, wine lover and cookbook obsessive Kristin Donnelly test-drives the most fun and inspiring new books that come across her desk. 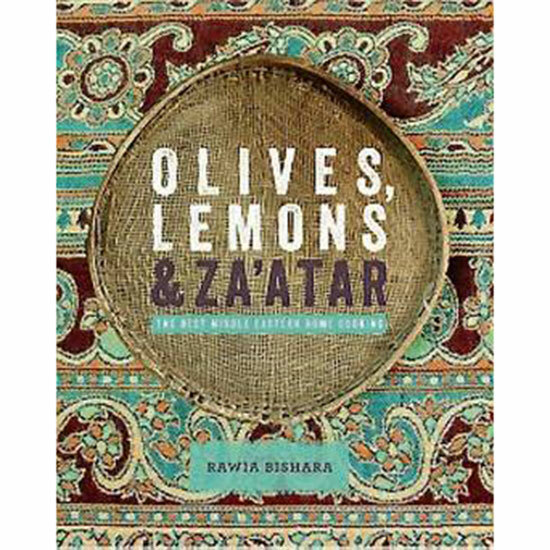 This week, Olives, Lemons and Za'atar by Rawia Bishara. In this series, food writer, wine lover and cookbook obsessive Kristin Donnelly test-drives the most fun and inspiring new books that come across her desk. Best for: Cooks who love Jerusalem or Middle Eastern food in general; people who follow the Mediterranean diet; readers who like a good immigrant story. Recipe highlights: Eggs with Za'atar; Yogurt Tahini with Chickpeas; Red Pepper and Walnut Spread; Simple Chicken Soup; Red Lentil and Butternut Squash Stew; Grilled Red Snapper in Grape Leaves; Spiced Lamb Shank; Smoked Wheat with Lamb; Flourless Tangerine Apricot Cake. Rawia Bishara's story is the stuff of legend: She moved from Nazareth, Israel, to the US, raised her family in Brooklyn and eventually started working at an organization to help immigrant women settle into American life. Coworkers told her to open a restaurant, so she did. Called Tanoreen, it lives on for 15 years and counting, and has been written about in national publications including the New Yorker. After all of this experience, Bishara wrote this book. I've been to Tanoreen just once, but Olives, Lemons and Za'atar makes me want to run right back. In all honesty, it's worth buying this book just for the chapter on breakfast. Could there be any more perfect way to start the day than eggs with za'atar, the addictive Middle Eastern blend of wild thyme, oregano, sesame seeds and tart sumac? Maybe tahini yogurt with cumin-spiced chickpeas and flatbread, also in the chapter, tops it. And then there's the mezze chapter with its flurry of dips, savory breads and a pickly things. What I love about Bishara's approach is that it's not at all dogmatic—she's a joyful and intuitive cook. For example, she shares her mother's recipe for a hummus without tahini, which could seem like downright blasphemy to some, but to her, it's a nice lighter, brighter alternative. She also encourages readers to experiment with seasoning, admitting she likes a lot of lemon while someone else might want more, say, nutmeg. Her chapters certainly cover some delicious traditional Middle Eastern dishes, like freekeh bel lahmeh (freekeh, a smoked green wheat, with lamb) and mujadara, a spiced lentil and grain pilaf that's the comfort food dish of the region. But Bishara also includes recipes she created during her decades of living in the US. For example, she had never seen gigantic globe eggplants before shopping at an American grocery store. She was inspired to cut the eggplants into pieces, fry them and then layer them with smoky baba ghanoush. The resulting recipe, which she calls Eggplant Napoleon, has become one of her signature dishes. Bishara also freely admits that she has created recipes—like the coriander-scented Salmon in Pesto—just to give lost American diners something familiar on the menu. This last example left me wishing that more immigrant chefs and restaurant owners wrote cookbooks. We'd get more glimpses of how people adapt their cooking to their new homes to fit with the available ingredients and the locals' palates. In a sense, we'd get to see how a new cuisine is created.